Here’s one of those tales from the depths of oligarchy-based influence peddling, showing the corrupt and the corrupted. The biggest villain, of course, is Las Vegas Sands CEO Sheldon Adelson, who sought to keep secret a pile of Sands financial records while he and his company battled a lawsuit brought by former Sands Macau exec Steven Jacobs. 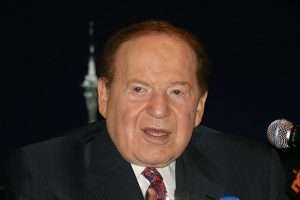 Jacobs, in his wrongful termination lawsuit, appeared to have plenty of leverage, given that Adelson, LVSands and the Sands Macau were concurrently the targets of giant bribery and corruption investigations launched by the Securities and Exchange Commission (SEC) and the Department of Justice (DOJ). 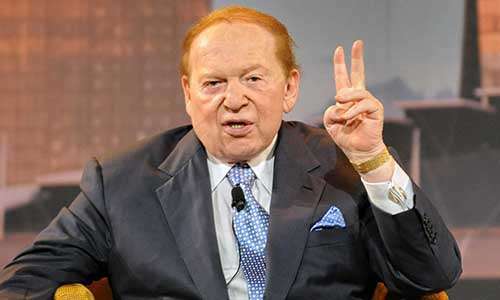 Adelson and the Sands have paid a healthy amount in settlements in recent times. The company shelled out $9 million last year in the SEC-led investigation, regarding violations of the US’s Foreign Corrupt Practices Act. Last month, over at the DOJ, it was another $6.96 million on similar charges. All that is really pocket change, if you happen to be Adelson, worth more than $30 million at last report. As if that was the only government institution Adelson has sought to corrupt. In Nevada, where the case involving Jacobs was heard, Adelson (pictured) tried repeatedly to have the presiding judge, Elizabeth Gonzalez, removed from the case, essentially because he wanted to keep all those records confidential and he didn’t get his way. Which brings us back to yesterday’s blockbuster tale from the Nevada Independent. It turns out that Adelson also leaned heavily on his bought-and-paid-for Nevada Attorney General, Adam Laxalt, to accomplish the same sealing of records, this time through a different channel, the Nevada Gambling Commission. Most insiders in Nevada politics, as the NI piece noted, already know that Laxalt is Adelson’s boy. Not only did Adelson fund a big chunk of Laxalt’s narrowly-winning election campaign, he’s kept the money train a-rollin’. Last year we explored the direct link from Adelson to Laxalt, via Robert Uithoven’s J3 Strategies lobbying and consulting firm, which also employs Laxalt’s sister, Tessa. It’s purely because of such corruption that we see such absurdities as Laxalt signing on a few months back as one of 10 state AGs to favor federal “RAWA” (Restore America’s Wire Act) legislation. One might remember that the whole RAWA push has been funded by Adelson as well, as a misguided market-protection exercise. Laxalt apparently leaned heavily on Burnett, even outlining a way in which Burnett could accomplish Adelson’s aims without violating the law. Yet the activity at the core of the lawsuit was barely within the NGC’s reach, and the agency rarely delves into employer-employee matters anyway. But the push via Laxalt was so strange, though Burnett, that he needed protection. So he taped the main incoming call on the topic, and then sent it on to the FBI. The FBI, per the NI story, decided that no crime had been committed by Laxalt, but that it ventured into some grey territory seems for certain. The NI has also filed an open-records request to obtain that recorded call, which one can expect to be turned over to that outlet about when hell freezes over. Well dodged by Burnett, though it remains to be seen how this all plays out in Nevada gambling politics down the road. Laxalt is assuredly among the corrupted at this point; there was no reason for him to get involved in the matter at all, except to pay back big favors to his benefactor. It’s yet another day in the life of Sheldon Adelson, surely America’s most hated billionaire.